Note: In the case of continuing education courses lasting less than three months, the card will be provided by the Computer Service - technical support (floor -1). If you want to make use of at least one of the above services must request the activation of the student card, floor -1, the Information Technology Service - technical support. Note: For access to canteens SASUP, an email should be sent to cartao@up.pt with that statement, accompanied by student number. The issue is free and secured by Banco Santander. 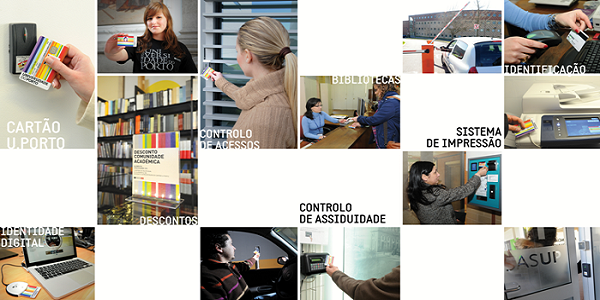 Consult procedures for requesting the card in the portal of the U.Porto . The card request process begins with the filling of a digital form (online), accessible via: Personal Area -> Option: "U.PORTO card"
After its completion, you should print or save the point of the card application (00024LXXXXXX) and deliver it at the Santander Totta, on level 0. It also has the opportunity, if you wish, to join the bank component. In this case, you should bring upon accession, BI / Citizen Card, tax number and proof of address. Questions or clarifications on U.PORTO card issuance process should be directed to the User Services Unit via e-mail cartao@up.pt . In order to ensure that all new students have access to the resources mentioned above (parking and printing system), the Faculty offers a temporary card, active for a period of 30 days. This card is only for students who have already requested the U.Porto student card and wait for its delivery. Must be requested in Computer Service - technical support (floor -1). Once you receive the U.Porto student card, you must request the activation in Computer Service - technical support (floor -1), and return the temporary card. Note: In case of loss or theft of U.PORTO card you can request a reissue of the card and must also proceed to the cancellation of the services present on the card through your personal area, right side option "U.Porto Card). You should also provide that information in the computer services of the Faculty for cancellation of the permissions to access local services provided by FLUP. For example: cancel the access permissions to the car park.